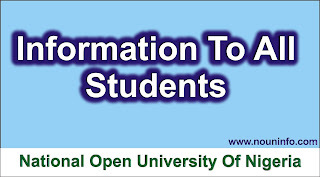 This is to notify the general public and the New students /Returning students of the National Open University of Nigeria (NOUN) that the management of the NOUN University has released the New NOUN TMA Timetable (Timeline) with the New Guidelines and TMA Opening date / Closing date for the 2019 Tutor-marked Assignment exercise. 1st NOUN TMA submission will start on Friday 8th, March 2019. 2nd NOUN TMA submission will start on Friday 22nd March 2019. 3rd NOUN TMA submission will Start on Friday 5th April 2019. All Students can only read and do their TMAs. No printout this time. Only a TMA will be available to a student at a time following the TMA timelines provided. This means that no TMA is open-ended. You must do your TMA within that period or risk a zero mark for your TMA. You must attempt TMA and exams to receive an end of semester grade for every course registered, this is a standard rule for the university. Ideally, a student should pass both TMA and exams to receive a pass mark for the course. Therefore, students should endeavor to do their TMA themselves as TMAs prepare students for their final examinations.